As a Canadian member of the Vegan Organic Network in the UK, I cannot emphasize highly enough how valuable a resource this organization is. Please check out their website for tons of fact sheets, and consider joining to lend your support. Members can subscribe to the quarterly journal, Growing Green International, which is always a fascinating and informative read for growers of all experience levels. The Veganic Agriculture Network based in Quebec, Canada, also has a fabulous website with lots of great info. Bookmark these two important sites, and visit the links list on the right hand side of this blog to see what else is going on out there in the revolution (including a list of great books)! If you have appropriate links to share, please get in touch and I'll add them to this site. There are multiple pages here on the DIVA blog, FYI. Also some great videos (including vintage footage of the late Robert Hart on the Forest Gardening page). Scroll back to earlier blog posts for more. Happy spring planting, everyone! Shizen Nouhou or “Natural Agriculture” has many different faces. As the name suggests, it is a way of growing food similar to other ecological farming methods, such as organics and biodynamics. But it is also a way of eating, a way of cooking, and a way of thinking about food. 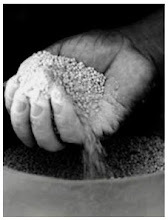 It is practiced by farmers and consumers alike, by individuals as well as entire communities. Founded in post-WWI Japan by farming pioneer and spiritual leader Mokichi Okada, Natural Agriculture is now practiced throughout the world. “Farming to Create Heaven on Earth” is an exploration of the philosophy in all its modern applications, from a CSA that feeds 1,500 families in Tokyo to a high-desert garden in the wilds of Southern Colorado. 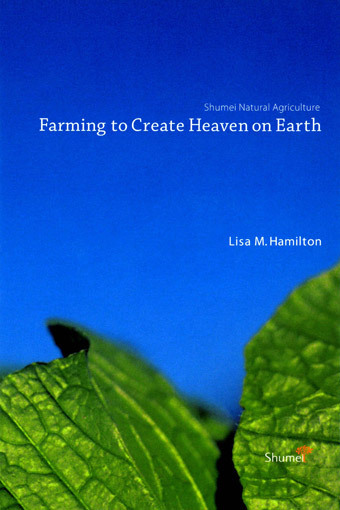 Illustrated with more than one hundred color photographs, the book profiles dozens of different Natural Agriculture farmers and consumers and how they guide their lives with this unique philosophy. by Dave of Darlington. £8.50.The book is a compilationof the writings of Dave of Darlington – atreasury of useful information for gardenersand farmers, gleaned from Dave’s longexperience and enhanced by well-informedthoughts on the ethics and politics behind farming. Please visit the Vegan Organic Network website to purchase these and other great books on veganic growing also included under 'Books' in the list on the right hand side of this page! Veganic permaculturalist Helen Athlowe talks about 'conservation farming' in this clip filmed for a permaculture site several years ago featuring land in Montana. She moved on from there to BC, Canada to pursue an interest in forest gardening. Today she consults for other farmers and is sharing the vegan organic message in the USA and Canada, and her veganic practises know-how in various ways. 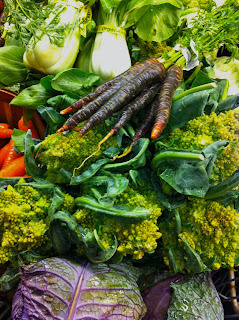 Visit "One Path to Veganic Permaculture" on line for more photos! This former cattle farmer is now a proponent of stock-free growing methods. This blog shares a wide variety of information about stock-free growing, not limited to vegan or vegetarian farmers. The following animal-positive event in Quebec, Canada, however, is designed specifically for vegans interested in learning about this topic. Teachers are Shantree and Lorenna Bousquet-Kacera of the Living Centre in London, Ontario, Canada. Please spread the word! Minimum of 10 people,maximum 20.There must be at leat 10 people by April 1 for the course to happen.Minimum 10 participants,maximum 20.Il faut au moins 10 participants avant le 1 Avril. Please see the Forest Gardening page on this blog for more videos on that topic. Give a listen to this interview with Meghan Kelly and Stephane Groleau of the Veganic Agriculture Network, on vegan activist Caryn Hartglass's excellent radio show REAL (Responsible Eating and Living). Brief discussion about the activists' plant-based lifestyle proceeds the conversation about farming. 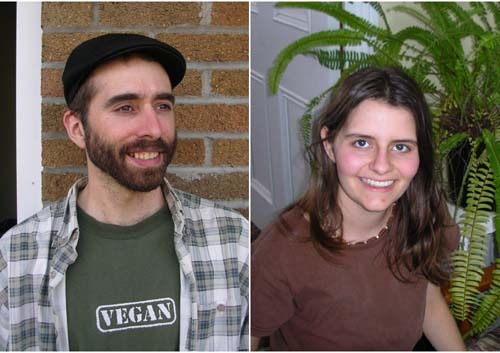 Stephane and Meghan founded the Veganic Agriculture Network in 2008 to promote farming and gardening that is free from chemicals and animal by-products. Their website www.goveganic.net features profiles of veganic farms in North America, and introduces people to the main concepts of farming and gardening in a way that is environmentally sustainable and compatible with a vegan ethic. In 2004, Stephane visited veganic farms in Europe for 9 months, and began the website www.vegeculture.net to promote veganic agriculture in the French language. He has a diploma in Organic Agriculture from the Cegep de Victoriaville and is a frequent writer for the magazines BioBulle and Growing Green International. 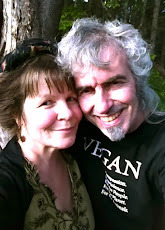 Stephane and Meghan both garden veganically in the village of St-Casimir, Quebec. Ken Fern introduces a variety of rare and unusual plants, particularly those which have edible, medicinal or other uses. Practising vegan-organic Permaculture with emphasis on creating an ecologically sustainable environment based largely on perennial plants. Also called stock-free farming, vegan-organics is a system which avoids all artificial chemical products (synthetic fertiliser, pesticides, growth regulators), genetically modified organisms, animal manures and slaughterhouse by-products (blood, fish meal, bone meal, etc). 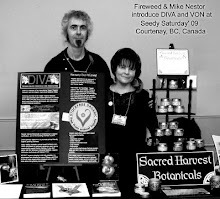 DIVA employs the word 'veganiculture' to reflect the integration of vegan-organics, permaculture techniques free of domestic animals, and the cross-cultural adoption of veganism as a dietary and lifestyle choice where possible around the world. We have a small holding where we grow food for ourselves veganically, as well as herbs for our small scale herbal product line, Sacred Harvest Botanicals. 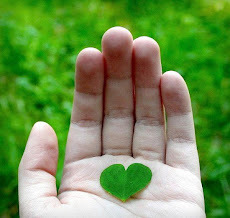 We welcome association with other gardeners or farmers in our bio-region and beyond who are also choosing to move beyond animal-based permaculture models to stock-free growing in compassionate response to the problems of global warming, environmental pollution, world hunger, and unnecessary dependence upon non-human animals. 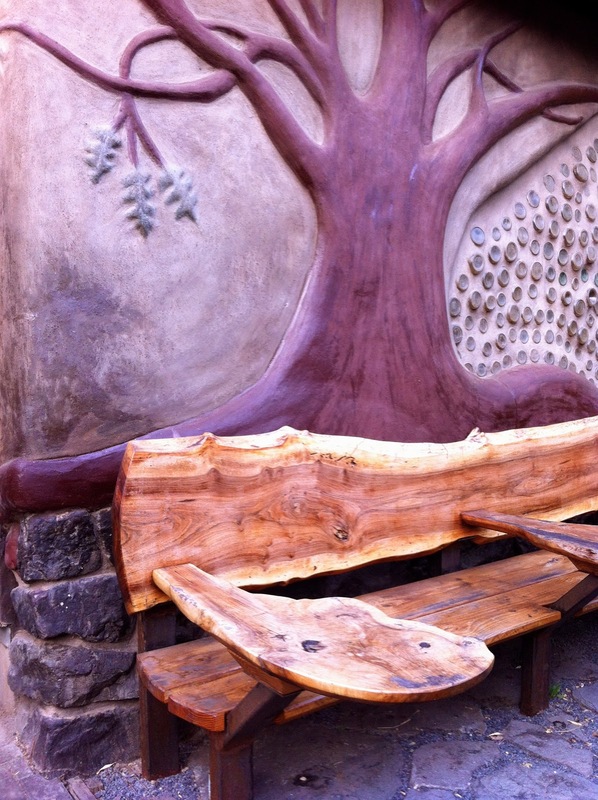 Please get in touch and we'll add a link to your site on our blog! CLICK HERE TO VISIT OTHER PAGES ON THIS BLOG! The words 'veganic' and 'stockfree' are sometimes used interchangeably today, which can be confusing. All of the links compiled here connect to places and people employing stock-free growing methods on their farms, small holdings, or in their backyards...to a significant degree! However, not all of the sites listed, or the growers themselves, may necessarily identify as vegan. Some farms may even include livestock, so be sure to ask how the term 'veganic' is being used to define a product you may be interested in. One of the goals of this blog is information sharing with as wide an audience as possible. Not all stockfree growers have websites, but below are a few who do, and links to others you can contact the old-fashioned way! Graham Burnett's "An Introduction to Vegan Permaculture"
Can permaculture really be vegan...of course! 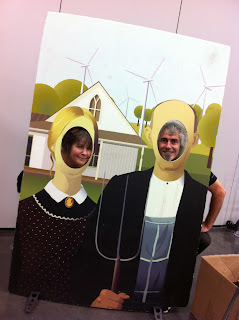 Treehugger article on humorous Huguenot Farm folks! Time for a Plant-based Agriculture! "I feel very deeply about vegetarianism and the animal kingdom. It was my dog Boycott who led me to question the right of humans to eat other sentient beings." 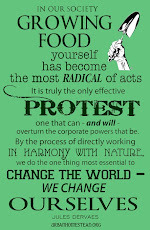 --the late Cesar Chavez, human rights champion and founder of the United Farm Workers... and fellow VEGAN! 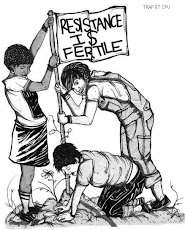 Vegans are ethically opposed to the use of animal products, so avoiding the unnecessary use of animal manure, etc, in community garden initiatives is one way of being inclusive of vegans, as well as omnivores who may not share the same ethical concerns about animal products. Hopefully, greater awareness follows the realization that manure is not only unnecessary, but that learning other ways of building soil fertility will benefit real food sustainability on our planet in the long run.